Love this post and your thoughts on solids and LOVE your quilts as always! I'm rephrasing my comment because I used a poor choice of words previously. But I've not seen anyone use solids in a magical way that you have, Marianne. Absolutely nothing boring about your art work with solids and everything inspirational about it! This is a fantastic and inspiring post, Marianne. Thank you! Loved to read this post Marianne! Great reflections! All these quilts are beautiful. I really want to try the shot cottons. Wonderful post, so much information. When I did Creative Textiles at Art College we had to colour all our own fabrics, starting from white, so now I'm loving using the marvellous prints available now! Your work with Oakshott is amazingly beautiful. 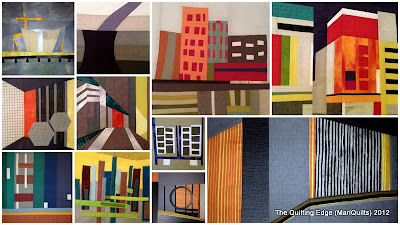 I love how you use the solids almost as if they were paint, your quilts are just stunning, each one of them. Such an inspiring post, thank you for sharing. What a great post! I can just feel the ideas and creativity pouring out of you - and then of course I can see the stunning results. Great thought provoking post for me. I too have come to the way of solids and have even made a couple of all solid quilts now. I will always have a strong affinity for Kaffe's overload of pattern. His early books were what really turned around my quilting and continue to influence today. But now solids are just as big of an influence. Your work is truly truly art. Thanks for sharing. Have always steered away from solids - but I think you have just changed my mind - they are stunning! I still love my prints...but working with solids is wonderful as well. Fun and thoughtful post you have here!! I NEVER had any solids in my stash until I started quilting a few years back. I still don't have the quantity I would like but I feel it will be an ongoing process. That is, whenever I stop rebelling about the fabric prices and start buying fabric again. It was 20 months yesterday! As ususual, your work is always inspiring!!! Lovely post. Anyone who knows me knows i love solids! I dream of having a bolt of every single Kona solid out there! The bright, saturated, vibrant colors especially. Inspiration for me comes in the form of how colors interact with each other. And I like simplicity. That's why I use prints sparingly. Love to read about your process. Thank you for sharing your perspective. I would love your opinion as to what thread to use when quilting my oakshott quilt. I blogged about it today... My query took me to searching on Flickr which s how I've found you (again!). I would appreciate your thoughtsn if you would be so kind! This was very interesting to read and see your work again in a new perspective. Thank you fro sharing it.